I think it’s awesome to get a good picture of a bug. 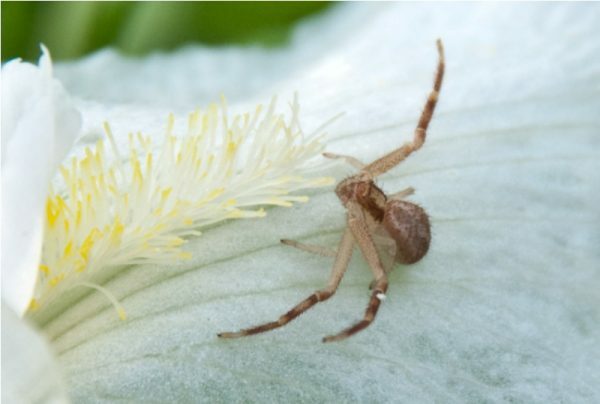 They’re challenging, for the most part, especially the flying insects. I’ve already blogged a bit about bees and I hate to be repetitious but here are some of my favorites although some aren’t really artistic or anything, they’re bugs after all. I found this tiny guy sitting down to a snack on one of our flowers in the back yard. 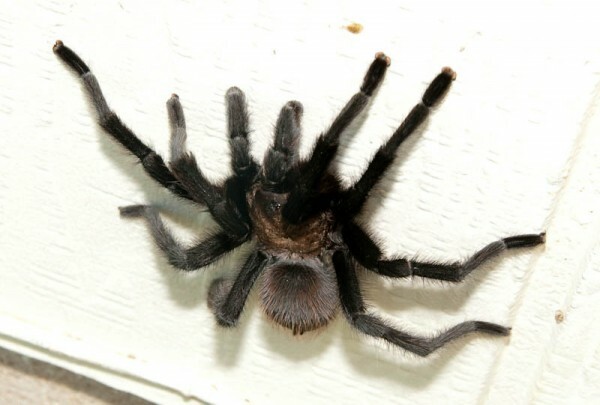 He’s tiny and would sit happily on the tip of a ballpoint pen but lookes much larger due the 250mm lens I used. 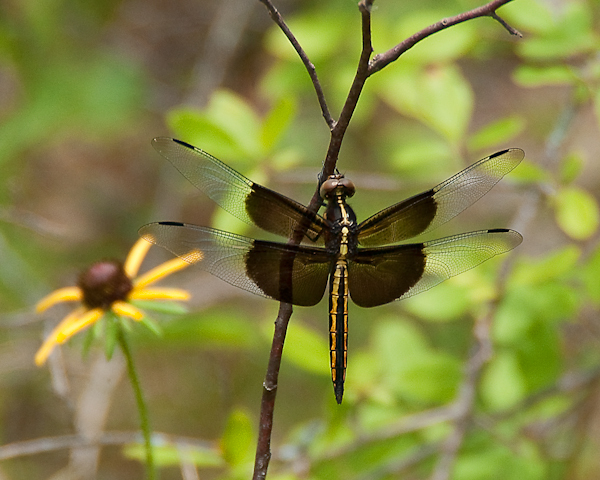 Dragonflies are another favorite though they’re very quick and shy. I saw a patch that dragon flies were going in and out of and just sat there for awhile and sure enough one came along and planted itself in just the right spot! 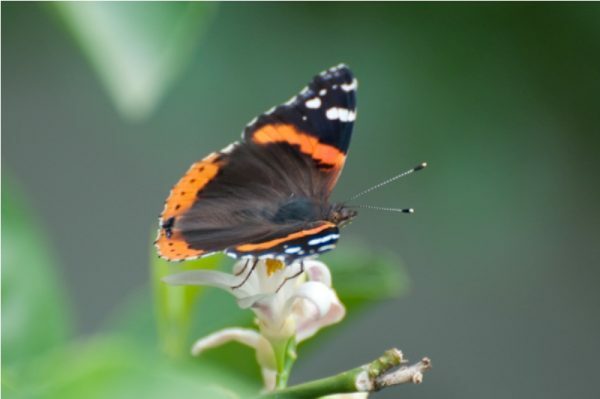 Butterflies are also shy and flit around quite a bit. I find them challenging as well. Though sometimes all you have to do is offer them a good drink and…. 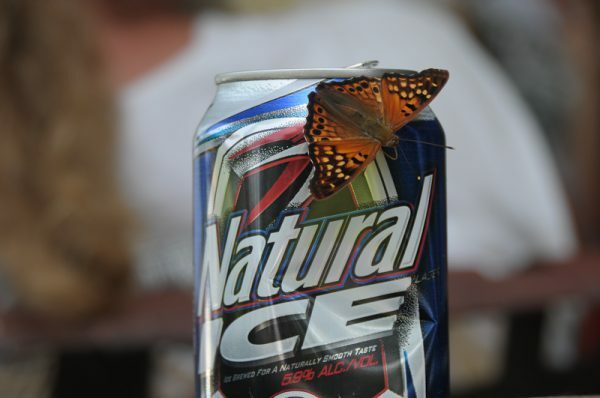 I guess there must be something natural in Natural Ice because the butterfly really liked it. Spiders are another fun insect to capture though I am intimidated by getting bit by them. In Louisiana we had cochroaches – In central Texas we have THESE things that I believe probably might eat them which brings me to this multi-eyed spider that enjoyed the camera TOO much. 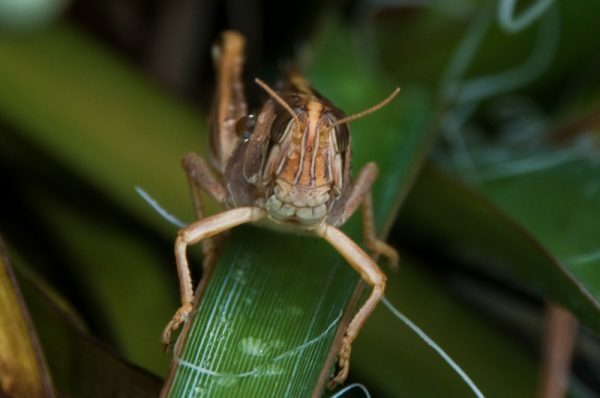 Then I found out about grasshoppers. I was chasing this guy around the yard and after I uploaded the photos to the computer I discovered it appeared he was smiling broader than a beer pitcher. 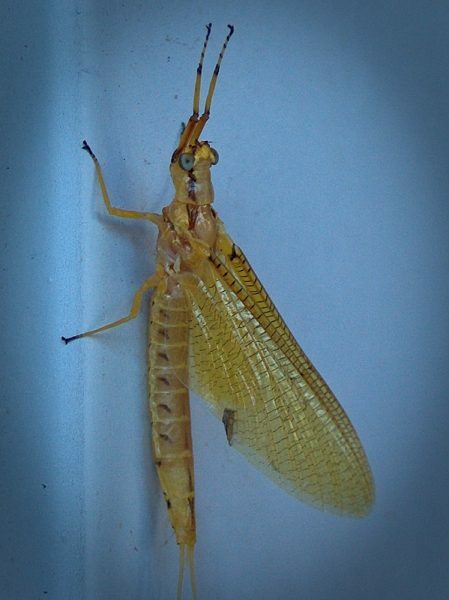 Then there are the bugs that you have no clue what they are – they just look, well, weird! I could go on quite a bit about bugs as I have quite a few shots of different dragonflies and things. I may post the more interesting shots later. I enjoy photography and I’m working on PEOPLE for once so maybe I’ll be able to branch out a little more. Thank you for stopping by and taking a break. Hope you enjoyed it and that I didn’t creep anyone out with the bugs. Dragonflies are a favorite of mine, too. I did get some photos (not as great as yours though!) when I was preparing to do a knitting design with a dragonfly theme. That design is still in the works (actually was put on the back burner last fall when I went into a design slump). Maybe this will motivate me to pull that out and look at it again. That’s awesome! I got a photograph of a bug that lives for a day? Let me know if you blog your bugs I would love to see them! Thank you for the great comments! These are all really great Bob! I like the dragonfly one the best. The spider ones are kinda creepy (ewww) but still good! 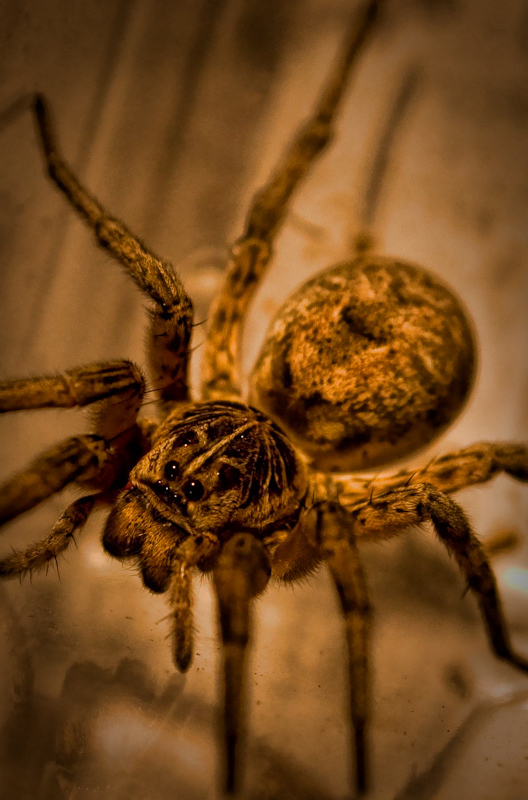 Spiders have 8 eyes and boy, they really are creepy. They have parts that looks unusual and don’t know what to make out of them. Hey, thank you so much for the comment! Hope you enjoy the ‘Blahg’ – more to come.